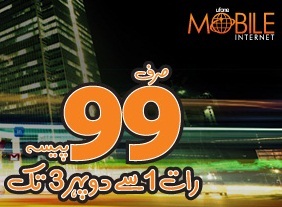 Ufone has introduced a Special Unlimited Mobile Internet Package for its Postpaid and Prepaid customers with which customers can now avail Unlimited Mobile internet from 1:00 AM to 3:00 PM for just 99 paisas or 0.99 Rs. This special Unlimited Internet Package is a daily subscription based offer i.e, Rs. 0.99 will be deducted on daily basis. Package will automatically renew on daily basis and Rs. 0.99 will be deducted on daily basis for re-subscription. Subscribe: To subscribe to this package dial 100 or SMS SUB to 810 short code. UnSubscribe: To unsubscribe from Special Unlimited Internet Package SMS UNSUB to 7810 short code. Note: Fair usage policy of 4 GB limit per day apply. MMS, Premium URL or Ufone WAP Portal premium downloads will be charged as normal Users can get GPRS and MMS settings by calling Ufone helpline 333 or sending an SMSwith “handset model” to 222.